OK, I'm just going to come right out with it...I'm not a fan of the interior wall color in the new house. I'm just going to admit...up front...that I don't love those flesh colored walls. About 10 years ago that was one of the "it" wall colors, and I had it all over my other house. It took me 10 years to get it changed out and I don't want to go back. Please don't think I'm ungrateful...I'm super grateful for this wonderful house, but I'm still in love with all things "Greige". If you look closely you can see a pillow on the floor next to the front door. It's one of the pillows that came with my new linen-y Chesterfield Sofa, and honestly it looks "not so great" with this wall color. Hubbs and I had been making lists of all the things that we needed to take care of next month before we moved in and I was a little apprehensive to broach the subject. It's not like I can just say "Hey, let's paint the living room", since all the areas are open to each other. It's more like "Hey, let's paint the whole dang huge upstairs, we have nothing else to do or spend money on." I knew that if we didn't plan to do it now, it just wouldn't get done. He had a "moment", and then he said, "OK, what do you want to do?" 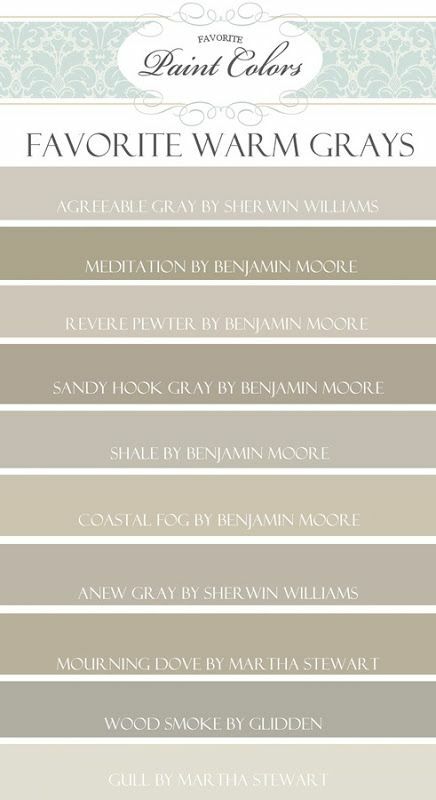 I heaved a sigh of relief and ran for my Benjamin Moore paint color fan decks. I just naturally head to Benjamin Moore for paint, as we've used it for most of our walls in our other houses. I've never had a problem with it, and they always have a huge selection of colors...down to the teensiest variations of Greige. I know what I'm up against since a couple of years ago when we painted the master bedroom and bath. At that point I wanted something darker and cozier. Now I want something lighter that's a combination of warm gray and beige. 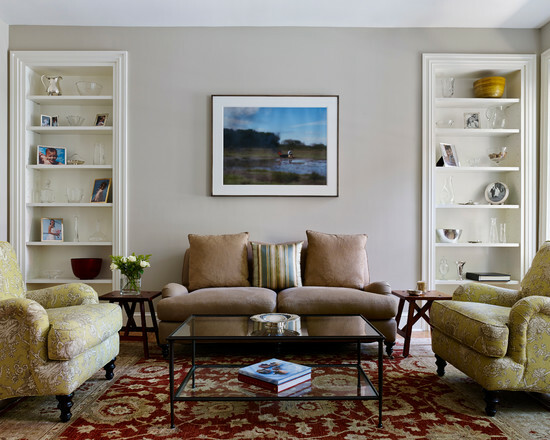 I gravitate toward "warmer" colors in decorating, and I find that a color that has elements of both can go a long way toward matching most anything. 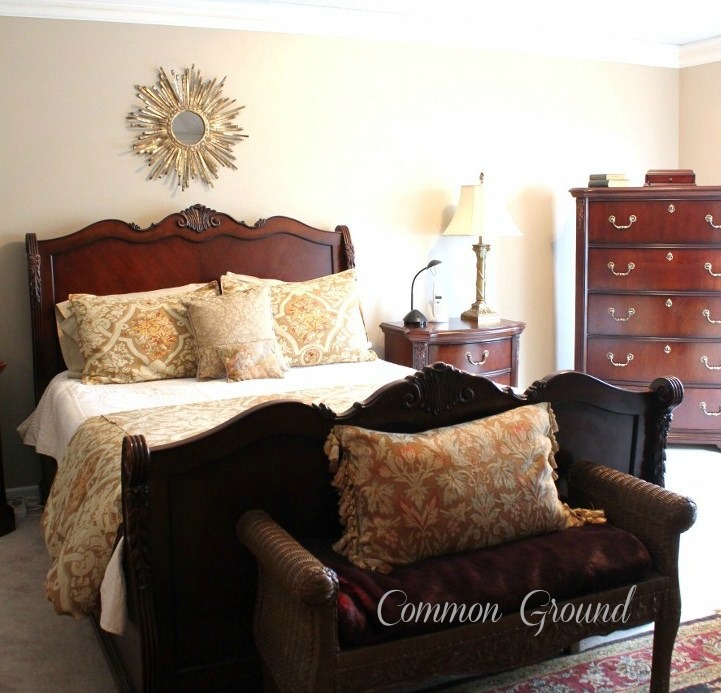 These are photos of my old master bedroom with Stone Hearth at 125%. They look pretty washed out. Sorry, these aren't professional, just my attempt to photograph a dark room. I tried about 6 colors of paint on the wall behind the bed. Greige can be tricky because you can run into undertones...pink, blues, greens, browns, even purple. I had one paint picked out that looked wonderful during the daytime, but became purple at night...no thanks. I know you've probably read this on many blogs, but the way to be sure of the undertones is to be mindful of the darkest color on your paint swatch/card. That darkest color will be your base color and undertone. I just hadn't considered this easy method. Glad I know now, it will save a lot of time, money, and a bunch of frustration. I know paint changes once it goes up on a wall, and there are so many reasons; size of the room, amount of light, other colors, such as rugs and furniture that may reflect off of it, time of day etc., but for now I'm looking at these colors and hoping one of them will work. Love how they're such a wonderful combination of both warm grays and tans. We have high ceilings and wide open spaces, so I think it can handle a slightly deeper hue of color. Plus I think this color will make the white woodwork and mouldings really stand out. 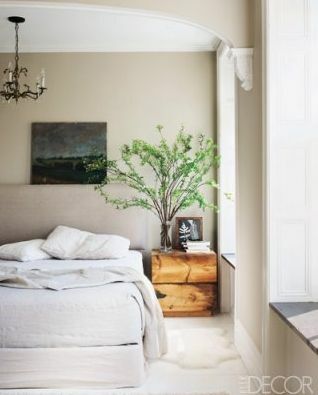 This is a good example of a Greige paired with "warm" furnishings. 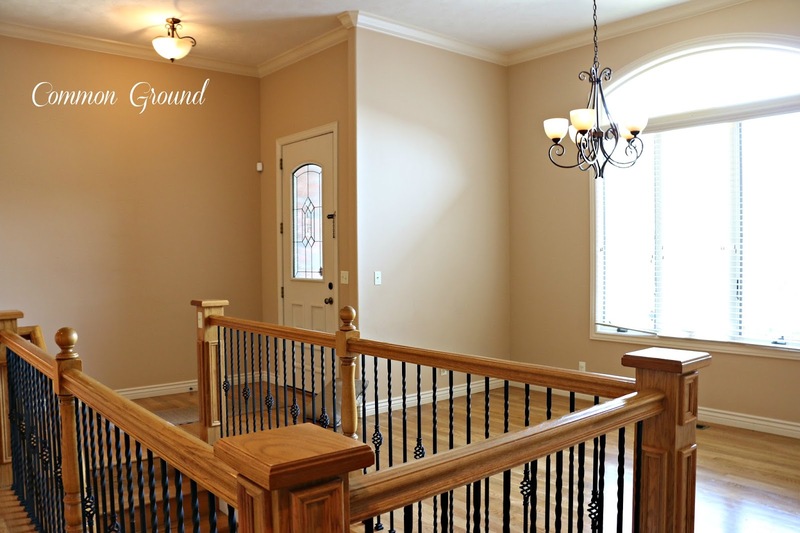 and this photo shows it with lighter colored hardwoods. I couldn't find room photos, but they are close, maybe just a little lighter. on my Pinterest Board Wall Colors. 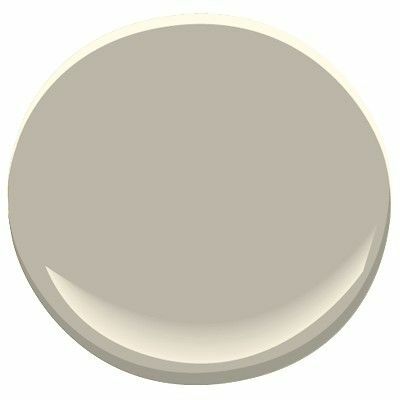 Grays and Greige are the trend in wall colors now, but not one that I think will be going away soon. 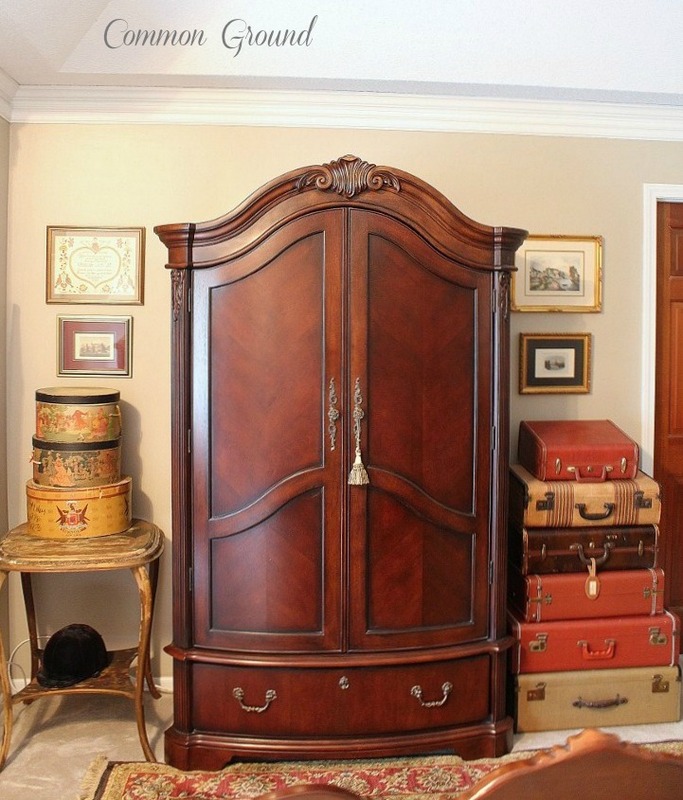 Any neutral that works well with all shades of woods and fabrics is definitely a mainstay in home decorating. I'm having fun making plans. Can't wait to get my hands on this place! P.S. I finally was able to see "Fixer Upper" on HGTV, gosh so addictive. P.P.S. Benjamin Moore did not sponsor this post, just love their paint. Hi Sonny, I came by to visit your blog and your new home is just lovely. I think you may just need to make steps to start a project, then the momentum will kick in. I know what it's like to be really down, this last year has been one of those times for me. I love all your lighter choices for the cabinets. Maybe getting some of your decor projects and surroundings started, you'd start feeling better. Hope you'll be feeling better really soon! I'm really affected by color and surroundings, sometimes I think that the guys just don't get it like we girls do. I adore your highlighted hues of Greige, dear friend!!! and it was much simplier without furniture in the way! This past Autumn, "Mr. Ed" painted our Guest room Agreeable Gray. I love Sherwin~Williams Paints. This hue is perfect for the room. on the Prairie during our raining Seasons, I took that fact to heart! "Mr. Ed" and I are in the process of updating the Entry Hall. Sherwin~Williams Cupola Yellow from the living room harmonously together! Good luck with your pursuit of selecting the "right" wall color for your new home!!! I am thrilled for you. . . Looking forward to seeing more glimpses in the near future! that Waverly wallpaper sounds gorgeous Pat, I love those traditional florals! 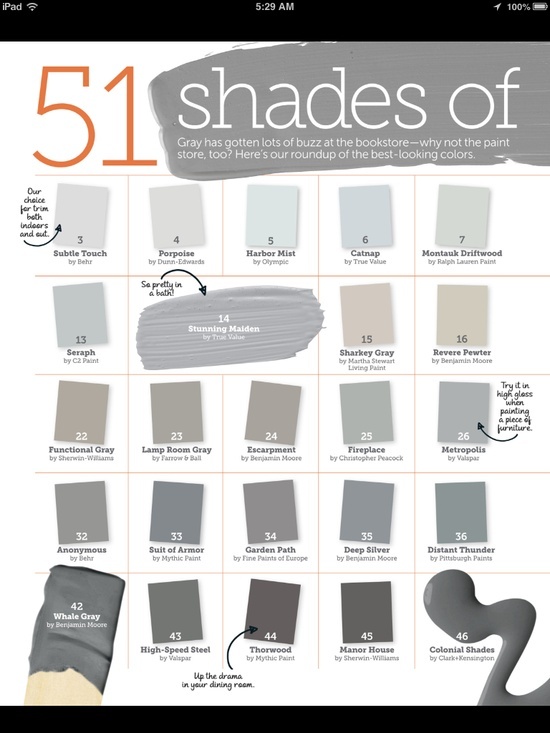 I agree, The "Agreeable Gray" seems to be a real favorite! I wouldn't try that myself, thanks for thinking of me, Brenda. We have a contractor that did a lot of work at our other house and he's the one that will be doing alot of the work on the new one. This house is about 2/3 the size of our other house, it has a basement, but I won't have to be running up and down the stairs all day. I love the first color you shared, Revere Pewter. 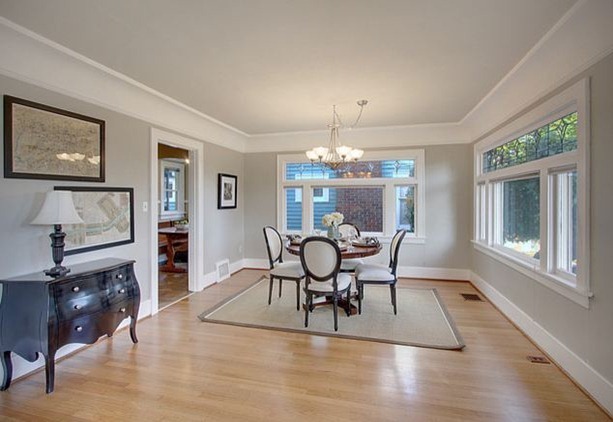 I've been watching the trends for a while now and decided that the gray walls and white trim combo was my favorite. Lucky your husband is so understanding! You know quite a bit about paint...I've never heard the advice about the top color on a paint stick... thanks. How exciting! I painted my house's interior Alaskan Husky by Benjamin Moore and I love it! You sound so happy to be finally starting on your new home, I'll be following along as you do each room! I love all the color choices. I know you will have so much fun decorating after you get the walls painted. I can see you are excited to finally have a home to call your own again. Enjoy the decorating journey. Looking forward to what you do with the new house Debra. :) Have fun with it! That is such a good idea to get the painting out of the way before you move furniture in!! I like Benjamin Moore paints the best too. Next to that would be Sherwin Williams. Looks like you've done your homework. I'm sure it will look great once it's all done! Your walls are gong to look beautiful in your new paint color no matter which one of those you pick, all gorgeous! Now I want to paint my walls too, lol! I can feel how excited you are about your new home! I can't picking paint colors since I end up painting the walls at least 3 times, ugh! I never heard about the top color either, so thanks for letting us know about that. 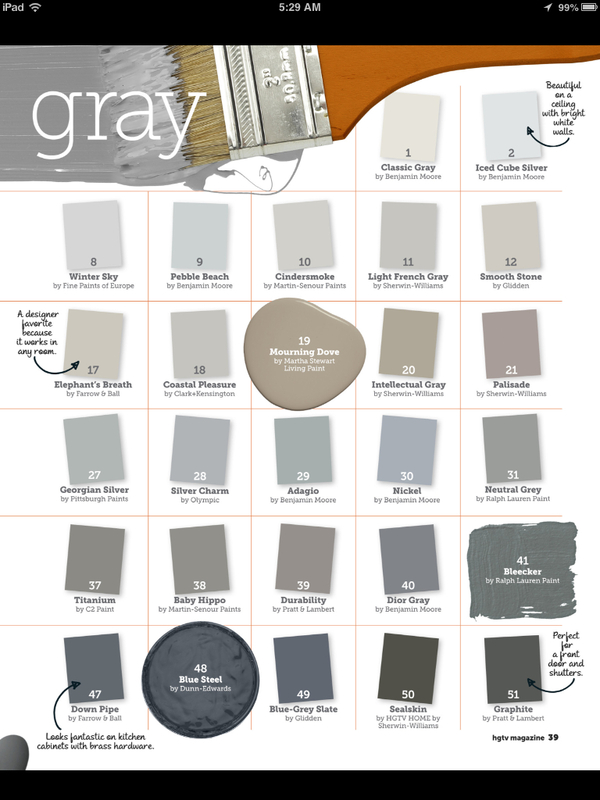 I know you'll pick out the perfect paint color! I have total confidence in you! I can't wait to see what you do with the new place. I love Fixer Upper. It's such a great show. Lovely grays, Debra! I am going to remember to look at the darkest color. I ran into the purple problem at the lake! I really like the Meditation color on the chart --- it seems to have a little green. 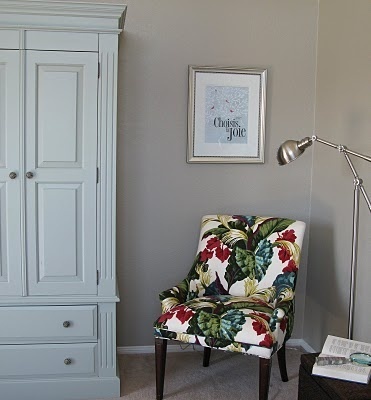 Isn't it fun to re-do a room with a coat of paint? I love fresh paint and that grey is SO pretty! Enjoy your day dear friend, HUGS! Choosing paint colors is so hard...but fun! We painted our family room Revere Pewter last year and I LOVED it so much I painted my studio and master bath the same color. I can tell you that a year later I still love it! Best of luck and enjoy the new home. Just catching up with your posts! Congratulations on your new home! I love the greige tones, too...we used Revere Pewter in our living room and Edgecombe Gray in our kitchen/ dining area. They look great with everything! Looking forward to seeing more from your new place! Oh lord.. i'm going through the wall paint color thing right now... and it's insanely hard. Normal life as we know it has stopped until i figure out a paint color for my house! I like your choices... you have a great eye so i know you'll pick something that is just right. I really didn't know that trick about the paint swatches... so that's a cool thing to know now as i keep trying 50 million paint color fails on my walls! It is so hard to choose the right color but I know you will make the right choice. It will be a huge job but worth it. Your new home is beautiful! Hi Debra, so happy to hear about the new home! You are smart to repaint before you move in. 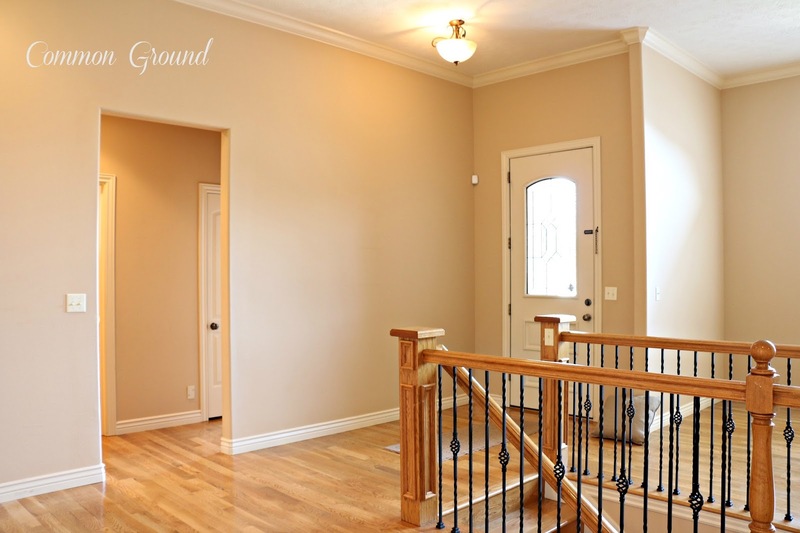 We bought our home 5 years ago and all of the walls are cream and the baseboards are the tan color, very similar to your wall color. I was tempted to paint all of the trim before we moved in because of love the freshness of white. Felt a little guilty because the house looked bran new. Seriously the previous owner only lived here 6 months and there were two nail holes in the wall. Thought I would do them in a couple of years. Well, guess who still has tan baseboards? I have the same problem of openness. I've finally came to the conclusion that it won't happen until we repaint the entire home. I always use Benjamin Moore paint as well. It just goes on so beautifully and covers well. Looking forward to seeing more! HI Debra, Looks like you are well on your way to finding your perfect color! I get cold hands and sweaty palms when I start looking at paint! I love it but it can be very tricky to pick just the right one. Greige has so many hues to me! Your new home is fabulous! You will give it your wonderful style in no time at all! I am sure whatever color you choose it will be perfect Debra! Can not wait to see you all moved in. Wow, great transformation! Although your before is nothing like our before! (ah, temporary rental homes and no money).